MIAMI, Fla. — The war between rival liquor giants Bacardi and Pernod Ricard over who owns the rights to the name Havana Club has been in U.S. courts for years, but Bacardí is courting public opinion through a theater experience that premiered in Miami and seeks to tell the story of the Cuban family who first created the famous rum and then fled the country after Fidel Castro took power. "Amparo," named after the widow of the late Ramon Arechabala, whose family founded Havana Club in 1934, takes the audience to pre-revolutionary Cuba and chronicles the story of the confiscation of their company by the communist government and their subsequent exile. Bacardi, the largest privately held spirits maker in the world, has been selling Havana Club made in Puerto Rico since 1995, after it purchased the recipe and rights to the trademark from the Arechabala family. In 2016, they introduced a new line along with eye-catching advertising that conjures up the period in Cuba before the 1959 revolution. But the French company Pernod Ricard says the trademark belongs to them and their Cuban partner, Cuba Ron. Pernod made a deal with the Cuban government in 1993 to distribute their version of Havana Club around the world. In Cuba, Havana Club has become an iconic product. Their marketing can be found all over the island in hotels, restaurants, the airport and market stalls, where T-shirts with the label can be purchased. Many American tourists purchase bottles and pack them in suitcases to take home. Cuba Ron's bottle has a different look and label from the one the Arechabalas produced, but the Cuban government has kept the year 1878 on many of the bottles — the year the Arechabala family brand was born. The website does not mention the history of Havana Club. The story behind the two words “Havana Club” has many twists and turns and began almost 150 years ago. Paola Arechabala recounted to NBC News, before Thursday’s performance, that her great-great-grandfather began producing and selling liquor and other products, like candy, in the Cuban city of Cárdenas in 1878. The company was called José Arechabala S.A. In 1933, they began distilling a unique rum called Havana Club, a name coined by an Arechabala family member, who worked for the company. The trademark was registered in the U.S. in 1934. Havana Club was different from the one they had been distilling under the name Arechabala Rum because of its flavor. It was a hit in Cuba and in the U.S. where it was eventually sold. “According to my dad, it was because it tasted great. If you ask people who lived there at the time they said it was delicious,” according to Arechabala. Right before the brand was created, Cuba was a popular tourist destination for Americans, partly because they could drink alcohol during a time when it had been outlawed in the U.S. The Prohibition Act was in place from 1920 until it was repealed in 1933. The Arechabalas created “the name Havana Club as a brand that would be looked at by people who drunk it as something reminiscent of Havana,” said Rick Wilson, senior vice president for external affairs for Bacardí. Arechabala said after her parents married, the communist government of Fidel Castro confiscated the company in 1959. “They [militants] came one day to the office, and they kicked my father and everyone out. They were all sent home,” said Arechabala. In 1963, Ramón and Amparo Arechabala fled the island with their eldest son and the recipe for their rum. Once in the U.S., the family met with liquor companies, including Bacardi, seeking a partnership to continue producing Havana Club. They were unable to find a partner because the companies were just reestablishing themselves at the time. Arechabala’s father ended up making a living by selling cars and her mother worked as a secretary at the University of Miami. In the meantime, the Cuban government was producing very limited amounts of rum under the name Havana Club as early as 1959. In 1976, Cubaexport took over the brand and revived it to sell overseas. But it was in 1993, when Pernod Ricard partnered with Cuba Ron, that the product began to pick up steam worldwide — except in the U.S. because of the trade embargo on Cuba. Arechabala, 48, now works as the director of a private school in Miami. She says she was very young when her family realized the Cuban government was producing rum under the name Havana Club. “Cheated” and “betrayed” is what Arechabala said her family felt. “It’s not authentic. I remember saying, as a child, they just erased my great-great-grandfather’s name off the bottle. It’s forgery,” she said. Bacardi, founded in Cuba in 1862, was also a top rum maker on the island before their assets were confiscated. Their business survived after exile because they had already built distilleries in Puerto Rico and Mexico. In 1994, the Arechabala family sold their Havana Club recipe and trademark rights to Bacardi. But the Arechabala’s trademark registration had expired around 1974. Cuba Ron didn’t waste time. 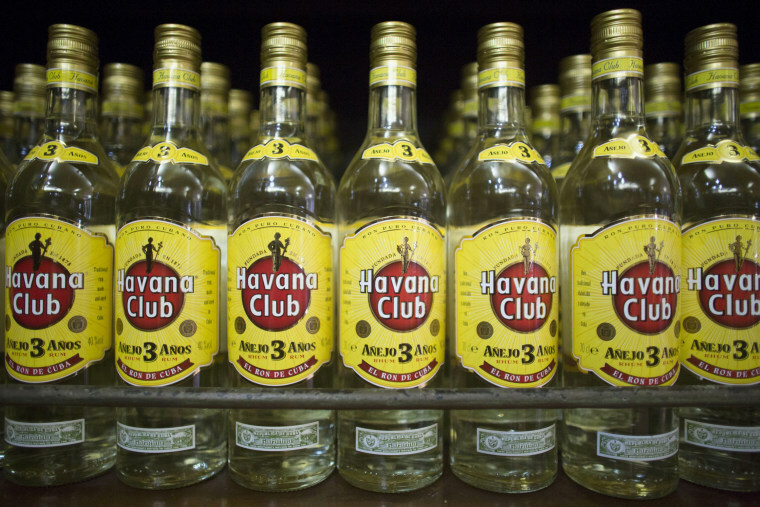 They filed for and received a registration for Havana Club in the U.S. When Bacardi began selling Havana Club products in the U.S. around 1995, Pernod Ricard sued, according to Wilson, and thus began the litigation that still continues more than two decades later. The latest motion, filed in 2016, asks the court to “clean up the paper registration issue” according to Wilson and further clarify who has ownership of Havana Club in the U.S.
Wilson argues that “you can’t just buy the paper registration. What denotes trademark rights in the United States is usage, who was using it. So there was an embargo in place and no one was using it at that time. Period,” he said. Each year, Pernad Ricard sells 54 million bottles of their Havana Club worldwide. The majority are sold in Cuba, followed by Germany and France. Bacardí does not disclose the number of bottles sold each year, but they are only available in the U.S.
“We own the brand worldwide...We have prevailed in litigation in all countries where our ownership has been contested,” according to an emailed statement given to NBC News by Ian FitzSimmons, Legal Counsel of Pernod Ricard. They have been sued in countries like Spain for ownership of the trademark. FitzSimmons argues the U.S. registration was not challenged for 20 years until the mid 1990s, when Pernod Ricard entered into a joint venture with Cuba Ron and the Arechabala family sold the recipe to Bacardí. In 2016, the U.S. patent office renewed the Cuban government’s registration of the Havana Club trademark. In Cuba and Miami, passions run high over Havana Club. Bacardí says consumers are looking for authentic product stories. They are banking on the performance of “Amaparo” to bring consumers closer to their product. After Miami, they will take the performance to New York for private showings. They plan to open "Amparo" to the general public in the future. “We want to make sure that people know our story, that they know the story of the Arechabala family and that we are based on the original recipe,” said Roberto Ramirez Laverde, Havana Club brand executive at Bacardi. Orlando Matos contributed to this report from Havana.